Farewell to software on CD? 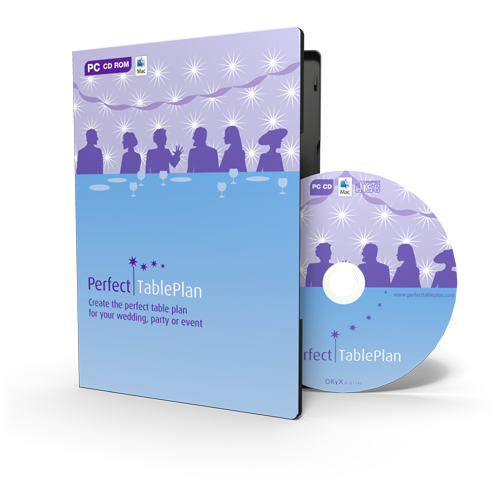 I currently offer a CD as an optional extra when customers buy my wedding table plan software. I have put stamps on so many CD envelopes that I might instinctively lick the Queen’s face if I ever met her. 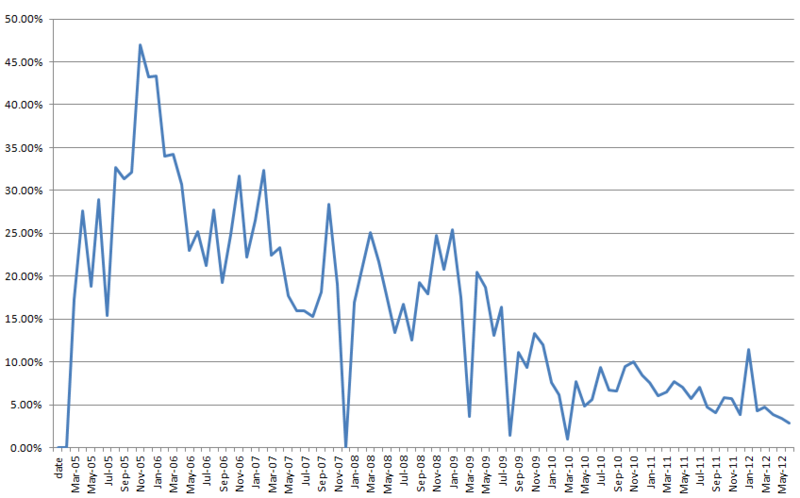 The graph below shows the % of sales that have included a CD over time. I have stopped CD sales for periods of a few weeks at a time, e.g. near a new release. I have emphasized CDs less over time on my purchase page. But I don’t think these have had much effect on the general trend. Download speeds are always increasing and customers are getting used to buying downloads instead of physical media. Anyone with a broadband connection can now download PerfectTablePlan in a minute or two. The demise of CDs is hardly ground breaking news, but I thought it might be worthwhile to show some real data. I won’t really miss CDs. They are an extra hassle to organize and the profit margins are slim and decreasing. I didn’t want to use the ugly looking CDs in a cardboard mailer that print-on-demand CD companies offer. I didn’t really feel it reflected well on the quality of my software. Particularly in the wedding market, where aesthetics are important. Instead I send a full colour silk screen printed CD, in a DVD box with a professionally designed, full colour wrap and insert. I order the CDs and packaging in batches of a thousand and burn and post them as required. I have managed to delegate quite a bit of this to a family member. But it is still a fair amount of hassle. CDs go missing in the post or get eaten by dogs. Also the UK post office recently hiked the cost of sending a CD + DVD case in a Jiffy bag by airmail from £2.10 to £3.86. A monstrous overnight price increase of 84%. But I don’t feel I can increase the CD price much above the current £7/$10 when you can buy game and film DVDs for less in the supermarket. The only plus side of CDs is that my data shows that customers that order a CD are 3 times less likely to ask for a refund (my terms stipulate that they have to return the CD). Given that refund requests are low, this isn’t a huge advantage. Also (repeat after me) correlation does not imply causation. I might run an A/B test to see if removing CDs from the purchase page makes any difference. But, given that only around 3% of customers are now buying a CD, I can’t see it making much difference. If I was starting a new product now, I don’t think I would even bother to offer a CD option, unless the download size was huge. Am I the only one still sending out CDs? This entry was posted in software and tagged cd, digital, download, dvd, media, sales, software, trend on 22 June 2012 by Andy Brice. The trend makes a lot of sense. But despite Software Candy being totally download-delivery based, we still receive calls from time to time from customers expecting a CD in the mail. We delightfully mail them one and we never charge them for the added shipping & handling cost. Your graph may explain very well why we can eat the extra cost. My CD percentage is 1.23% of all sales. Pretty insignificant number. The CD is 8.60 EUR and i have a profit of $4.97 for each CD. The CDs are not having nice stamp or cover as yours. I will keep this as a switched off by default option. Will consider removing it the first time someone complains that they got lost on the Order page. I had a few of those. But not many. Actually the number of emails I have received saying that the CD has never arrived are surprisingly small. We have offered cd’s over the last seven years and seen it consistently around 20%, really no drop to speak of what so ever. I would really suggest you raise the price as you offer a quality product and the CD in itself actually offers value to the client even if you don\’t see it the same way. This may actually increase your sales a bit. It’s a service for our clients that protect them when they change the computer or have a crash and don\’t want to bother trying to locate an installation file or try to find their original download information. That said, your cd sales maybe related to the ”temporary engagement” a wedding constitutes. The clients may feel that they want to plan the wedding urgently but realize that after that point they will not have much use for a backup. When I have raised the CD price previous it has reduced sales of CDs. I seriously considered baby related software at one point. But found that someone had done almost exactly what I was considering. I use PayPro service for CD mailing. Everything is automatic. CD comes with a DVD box and license key in a file. The end user price is $14.90 (I get $3 from each CD). 30% of buyers of the full version choose CD option. Our software intended for advanced users at price $75 without CD. Do they do a full colour CD + box wrap? I wonder why your % of CD purchases is so much higher? Is it a big download? Our software is only 12 MB (multimedia software for home users). Indeed initially we had a CD option at $9.90 and only 20% of customers choosed this option. Then I switched to DVD box variant on PayPro and increased a price to $14.90. 1. Increased price for a disc. 2. Replaced word “CD” to “DVD”. Later I placed a picture of DVD disc to the order page. Cover of DVD box + artwork on a surface of DVD disc.